Graham Attwell and Cristina Costa have written a nice paper titled ‘Integrating personal learning and working environments‘. The paper focuses on the future for learning and working environments in 2025. In the framework of the PROLEARN project, we have addressed many of the issues raised in this paper. There we created a roadmap toward professional learning in 2020. It would be a nice exercise to compare our results in predicting the future of professional learning and work. Google announced new (dynamic) themes for Gmail. A wrap-up of the PLE workshop at WCET08 by Jared Stein, Chris Lott, and Scott Leslie. Last Thursday, the main companies behind OpenSocial and OpenSocial fans have celebrated OpenSocial's first birthday at MySpace’s San Francisco headquarters. Below is a video of the event. The implementation of a connectivist/LaaN-based learning system can be similar to the implementation of database systems (DBS). I don't mean that connectivist/LaaN adopts an objectivistic view of learning where knowledge is viewed as an object and as a consequence can be stored in a database. It's just that we can borrow some of the concepts used in the implementation of DBS and apply them when trying to implement a connectivist/LaaN-based approach to learning. - H. Garcia-Molina, J. Ullman, and J. Widom: Database Systems: The Complete Book. Prentice Hall, 2001. - R. Ramakrishnan and J. Gehrke: Database Management Systems. 3rd Ed. McGraw-Hill, 2003. - T. Härder, E. Rahm: Datenbankssysteme - Konzepte und Techniken der Implementierung. Springer, 1999. A DBS consists of three main components: (1) Data System, (2) Access System, and (3) Storage System. The main component of the Data System is the query processor. The query processor’s task is to turn user queries into a sequence of database operations and execute those operations. The query processor performs two operations: (1) query compilation and (2) query execution. At query compilation, the query is parsed and a parse tree for the query is generated. Then the query optimizer, which is the most important component of query compilation, first, converts the parse tree to an initial query plan, which is usually and algebraic representation of the query, and then transforms this initial plan into an equivalent plan that is expected to require less time for execution. Second, the query optimizer turns the generated equivalent plan (logical query plan) into a physical query plan by selecting algorithms to implement each of the operators of the logical plan, and by selecting an order of execution for these operators. At query execution, the algorithms selected at the query compilation phase are executed. These algorithms fall mainly into three classes: (1) sorting-based methods, hash-based methods, and index-based methods. The Access System uses auxiliary structures to speed up the retrieval of records in response to certain search conditions in order to avoid scan of all pages or segments or even the whole DB. Indexes are often used in speeding up queries. The indexes commonly used in commercial DB systems are B-trees and hash tables. The DB data is stored on external storage devices such as disks and fetched into main memory as needed for processing. The unit of information read from or written to disk is a page (block). The basic abstraction of data in a DBMS is a collection of records, or a file, and each file consists of one or more pages. In other words, a DB relation (table) consists of a set of records and is stored on one or more pages of a disk file. The table below shows the analogy between a DBS and a connectivist/LaaN-based learning system. In LaaN, in order to learn, we build, maintain, and extend our personal knowledge networks with new explicit/tacit knowledge nodes. The diagram below depicts the processing of a simple query in the different layers of a DBS and a connectivist/LaaN-based learning system. Gmail now provides voice and video chat support, as announced yesterday by Google. 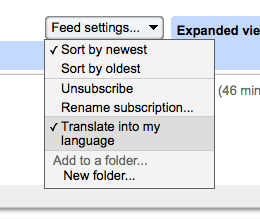 Google announced yesterday a new nice feature in Google Reader: automatic feed translation. The handouts (part 1, part 2) (.pdf) of the tutorial on Collective Intelligence given by Epaminondas Kapetanios at the ACM CSTST 2008 conference. A nice slideset used by Zaid Ali Alsagoff in his keynote talk at the 2nd International Malaysian Educational Technology Convention (IMETC). I believe this is exactly what our educational systems do urgently need...Change...A move away from command, control, and passivity toward openness, emergence, flexibility, participation, and dynamic. A video of Luis Suarez, speaking at the Web 2.0 Expo in Berlin, on his 9-month-long experiment in “Thinking Outside the Inbox”. Luis bas been trying in the past 9 months to use different social software tools rather than email in order to keep connected to his personal network. In this talk, he reports on that experience. Actually, I like the idea but I'm wondering why not to use both; i.e. social software tools and emails in parallel. I believe there are some contexts where it's better to use emails. A good article by Will Richardson in Educational Leadership on "Giving Students Ownership of Learning". More than ever before, students have the potential to own their own learning—and we have to help them seize that potential. We must help them learn how to identify their passions; build connections to others who share those passions; and communicate, collaborate, and work collectively with these networks. And we must do this not simply as a unit built around "Information and Web Literacy." Instead, we must make these new ways of collaborating and connecting a transparent part of the way we deliver curriculum from kindergarten to graduation.